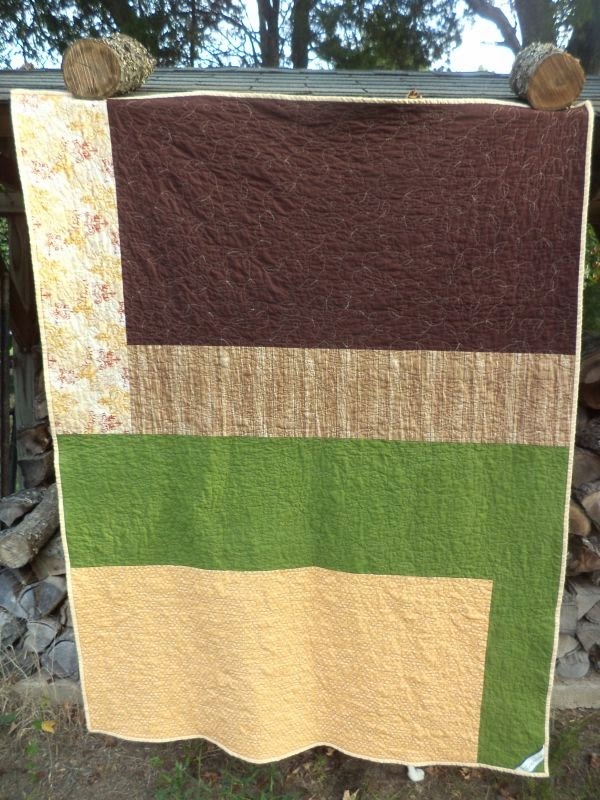 I was being rather optimistic when I made this fall-colored quilt. A couple weeks ago we were still in the depths of 98 degrees every day, drought, dusty, dripping sweaty summer! 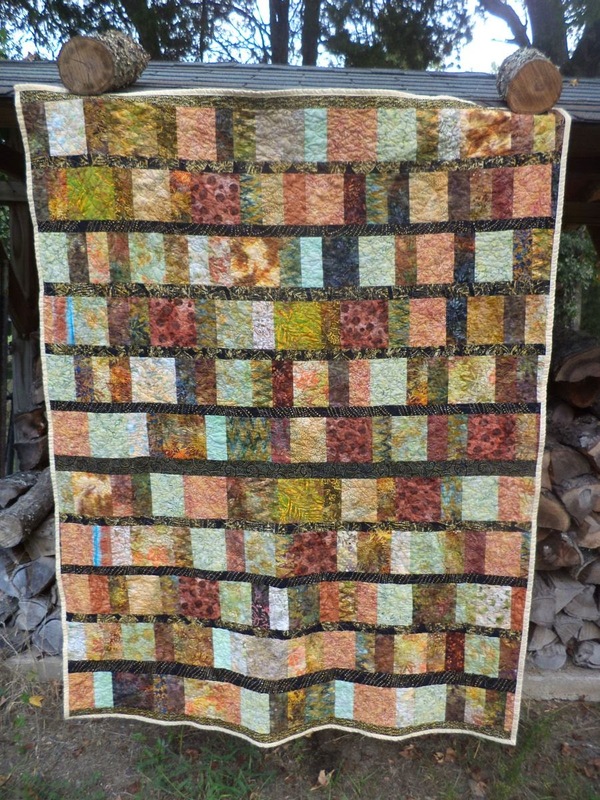 I named the quilt "Autumn, Eventually" because autumn will come, eventually, we hope! Well, here we are at the end of September and the days are finally turning cool and breezy! Not all of them, mind you, but more and more. Maybe we won't have too many more sweltering days til summer comes again next year. 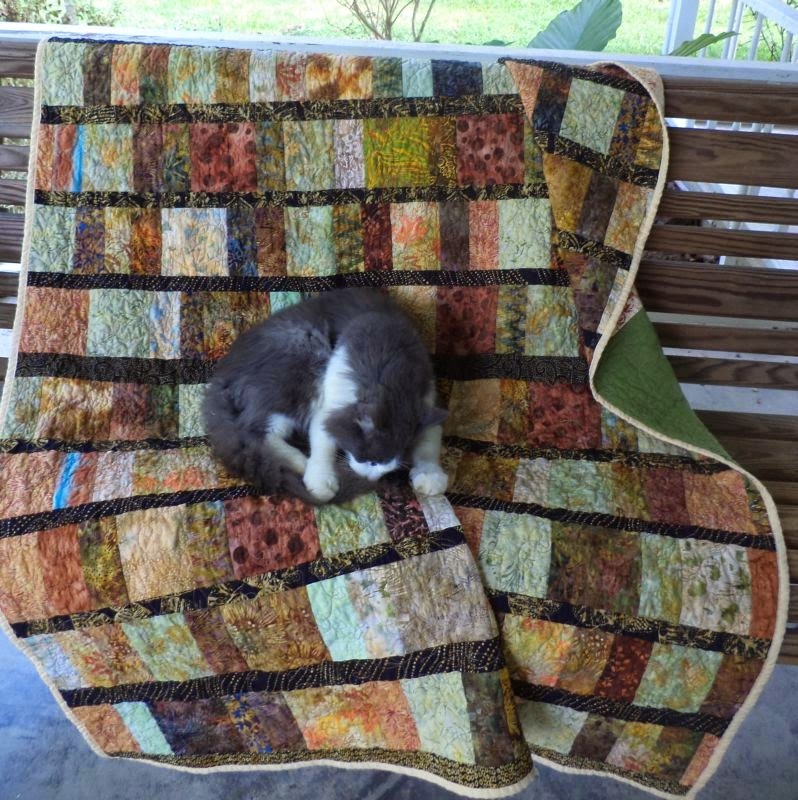 This quilt was made from some of the scraps Judy sent me. When I made me initial sort of the fabrics I pulled out several groups that immediately seemed to go together and this was one of those. I cut them all to 5" tall and pieced them together, a la my Scrappy Strip Quilt tutorial and the Scrap Palooza Brick Quilt. 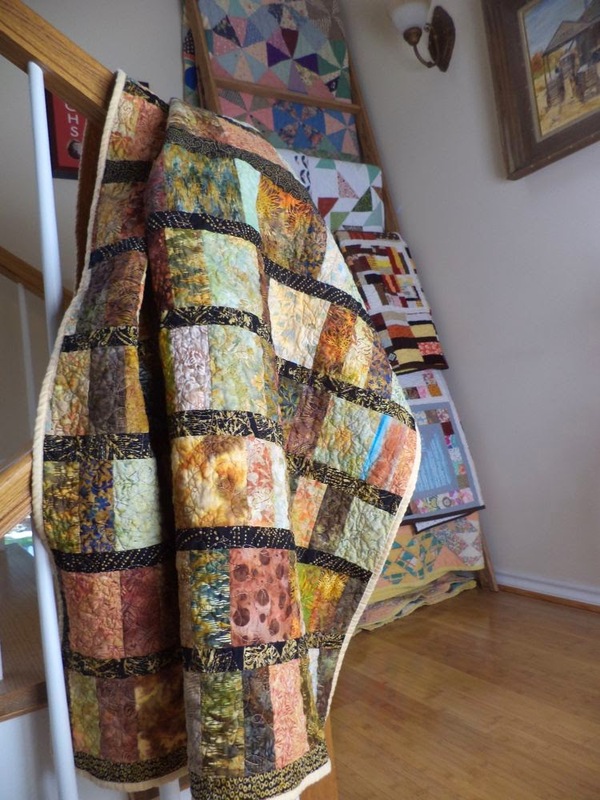 I decided to sash between the rows to separate them a little bit and ta-da, a quilt! I have several favorite fabrics in these but this oak leaf is one. 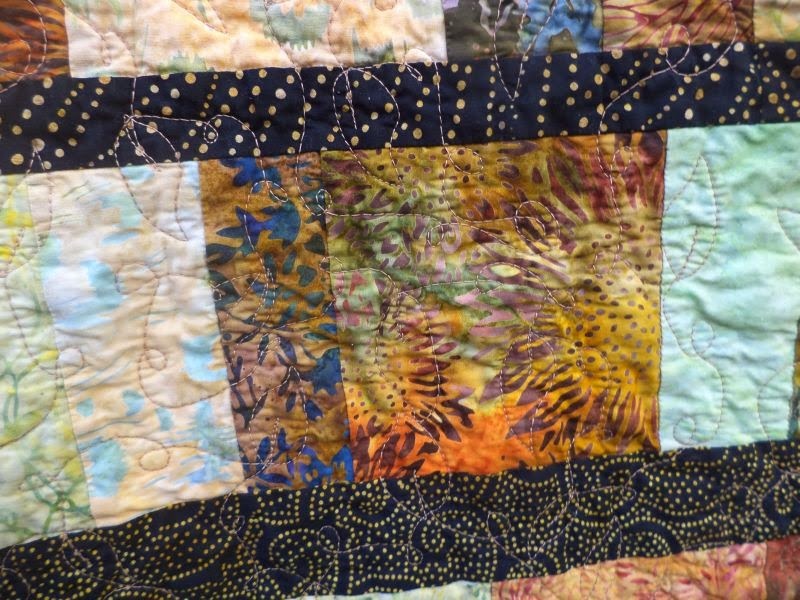 Theses colors are just delicious and the majority of the fabrics have nature-themed designs. 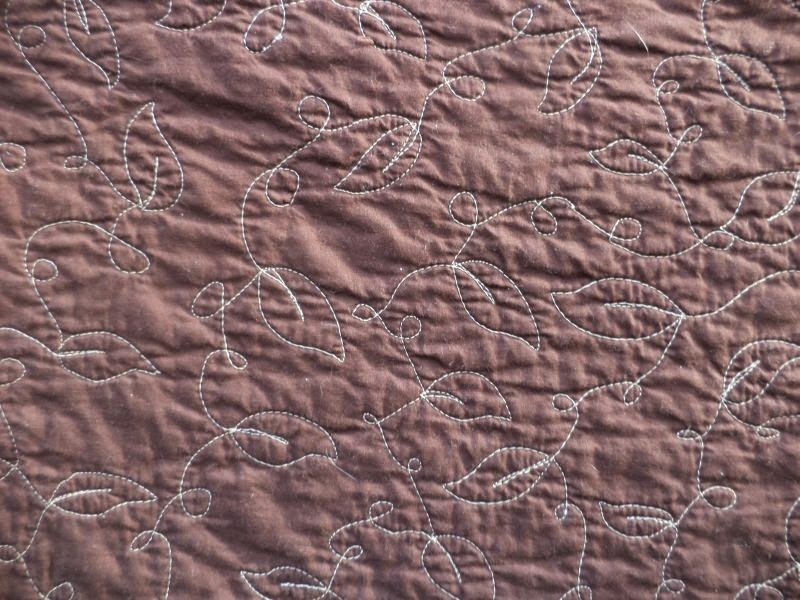 I did a new-to-me FMQ design, leaves and loops from Natalia Bonner's Free Motion Quilting book. Much easier to see from the back. I used a golden/tan colored thread in the top and bobbin. Speaking of the back, I pulled together a pieced back from my stash of nice fall-ish colors, a mix of prints and solids, and bound it in a soft yellow solid. 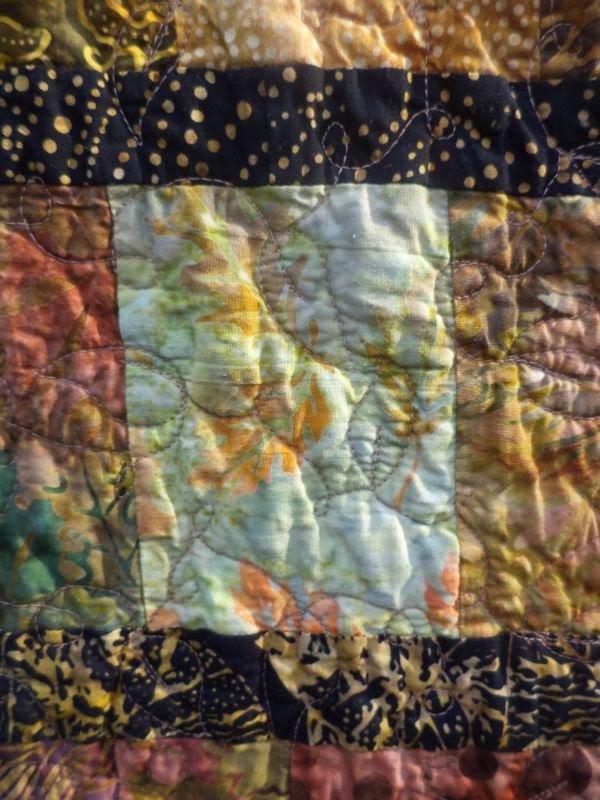 I'm not normally a lover of Batik fabrics but your quilt has used them beautifully. The fmq is just right too. A lovely quilt to snuggle under. What nice fall colors! Wonderful!